Hayley and Rick are having a tough time together. Things aren't going well at work for Hayley either, because she has a terrible boss. She rarely sees her family and she works as hard as she can to bring a good salary to the table, so she can take care of the people she loves. She fantasizes about a different life, what would have happened if she'd have married any of her other boyfriends? When she wakes up next to her first love the next day Hayley knows she should have been careful wishing something like that. There's no going back now and she has to see what marriage would have been like with each of her ex boyfriends. Has she made the right choices in the past or could she have been much happier than she is now? 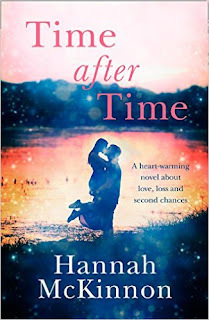 Time After Time is a fantastic story about a woman who wishes a different path for herself. When Hayley sees what it's like to be married to the men who used to be in her life before Rick she learns to see what's really in her heart. Each marriage brings her more understanding. With every man she dated in her past she learned more about what she wanted and what to look for in a partner. Being married to them teaches her something new about herself again. I loved that aspect of the story. Hayley's experiences make her wiser and they give her valuable insights into her own behavior. Hayley is a sweet and strong woman, but like every human being she has her flaws. She's a wonderful main character and I could easily picture her with each of the men she chose. She's strong and goes after what she wants. When she makes her decisions she doesn't question herself. I loved reading the mix of her past and present and Hannah McKinnon cleverly switches between them. Timing is important in a story like this and she knows exactly when to give what information. That makes Time After Time interesting and gripping. I couldn't wait to find out what would happen to Hayley and what being married to each partner would show her about herself. I think most people go through times in life when they wonder "what if." It's interesting to play on that theme in this book. I like that this story goes back & forth between Hayley's past & present.